It was the 4th of July, he was on vacation with his family, out kayaking with his wife when he yelled he couldn’t breathe before slumping over. His wife thought he was just goofing around with her. It was the last words he ever spoke. Today I attended his funeral. He was an acquaintance of mine but from the size of his service, he was a friend to many. I left wishing I had taken the time to get to know him better after hearing those who did so eloquently describe who he was. Their words and the sheer size of his funeral and wake (5-hour long line) have put me in a reflective mood. First, according to his own younger brother Marc was “not always a great guy” Yet, when he suddenly passed thousands showed up to pay their respects. Almost all of them, fortunately, got the chance to know the imperfect Marc who got molded into the “great guy” he became! The three words used to summarize up Marc Abbatacola’s time on earth were Zeal, Strength, and Love. I would be honored to be associated with those adjectives with my own life. His zeal, strength, and love no doubt played into his gift of encouragement. His passion was people and the size of his funeral was a testament to the fruits of his time here. Marc Abbatacola’s was one of the two largest celebrations of life funerals I’ve ever attended. The other was my high school football coach. Both MEN lived a life of conviction and took an unabashed stand for their faith. They invested their hearts and souls into loving others, and never minced words regarding their intentions for doing so. None of us get to choose when we leave this earth, all of us get to choose how we live while we are here though. 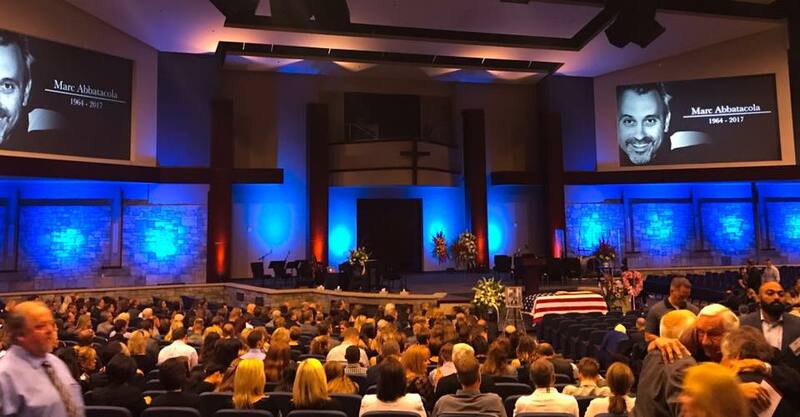 Seeing the mass of humanity at their funerals I have no doubt that Marc Abbatacola and Coach Rex before him, figured out the secret to making your life count. Live in the service of others, walk in a faith that shapes you for the better, and stand for your convictions regardless of whether society agrees with them or not. Do that and your time here on earth will count for a lot more than selfishly living for yourself. Newer Post Proper Care for Koi and Common Myths Older Post What Kind of Ship are you Captaining? !